TV Services are your local Sky Digital TV Authorised Agents and installers, and we can sign you up and carry out the installation along with showing you how your new Sky Digital TV satellite System works. Sky Digital TV provides digital home entertainment to Thousands of homes throughout Ireland, with its superb range of digital tv channels and interactive digital services. There are many options suited to all budgets to receive Sky TV. Sky Multiroom Why TV Services? How to join Sky TV? Simply call 0872362881 or fill in the online booking form and a TV services representative will contact you with all the various options of Sky Digital TV available to you. How to upgrade your Sky TV. Want to upgrade your existing service? To enquire about upgrading your existing Sky TV to Sky Plus HD, call one of our agents on 0872362881 or simply fill in the online booking form and a TV services representative will contact you with all the various options to upgrade your existing Sky Digital TV service. Sky Multiroom allows you to watch whatever you want wherever you want around the house. You can also control the one box from different rooms around the house. Simply call 0872362881 or fill in the online booking form and a TV services representative will contact you with all the various options of Sky Multiroom available to you. If you experience loss of signal, poor picture quality, or blocky/freezing images on your digital television system via Sky, TV Services can provide a prompt and professional 'Sky Repair' service to ensure your Sky TV satellite service is working at its best. By using digital spectrum analyzers, TVservices will ensure your Sky TV satellite dish is correctly aligned to receive the best signal possible, and that all fixings and cabling are installed as we would expect! TV Services provide a prompt and 'FAST RESPONSE' Sky Repair satellite service, and can have your Sky satellite system rectified within hours of your telephone call! To book a Sky service call Simply call 0872362881 or fill in the online booking form and a TV services representative will contact you to confirm your booking. Enjoy up to 32 live TV channels from your Sky package including thousands of hours of on demand entertainment online, on your iPhone or iPad for free. Forgot to record a show? With Sky you can use your smart phone or laptop to set your Sky+ box, so you never have to miss your favorite show when you are out and about. 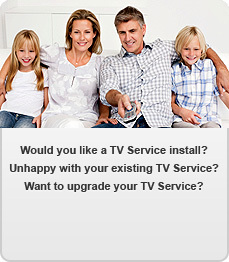 All TV Services Sky Digital TV Installers Have A Minimum of 5 Years Experience. Local Sky Digital TV Installers, With In-depth Knowledge of Your Area. Quality Materials & Tools To Ensure The BEST Sky Digital TV installations and service.